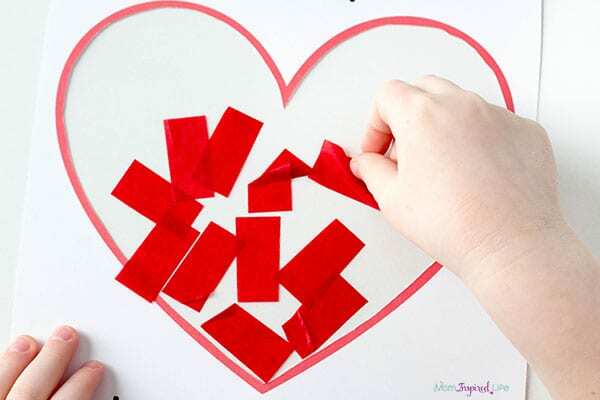 This Valentine’s Day craft activity is perfect for kids of all ages! 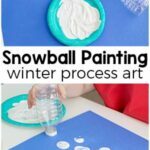 The included printable makes it super easy to do and the end result is beautiful! It’s a perfect gift for family and friends! 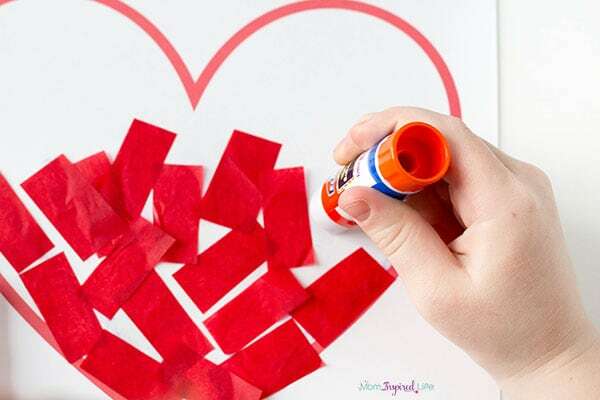 I love that this Valentine’s Day craft is easy enough for toddlers, but still fun for preschoolers and older children. Both of my kids were able to make it with no help from me. 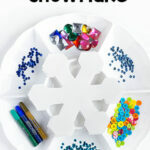 It is a low prep activity and the printable makes it even easier. As a result, this would be super easy to do in a classroom environment! 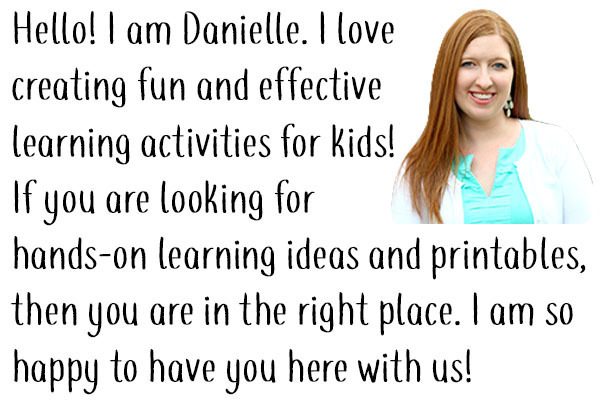 Print out enough copies of the printable for each child who will be making this. Cut out the center of the heart. 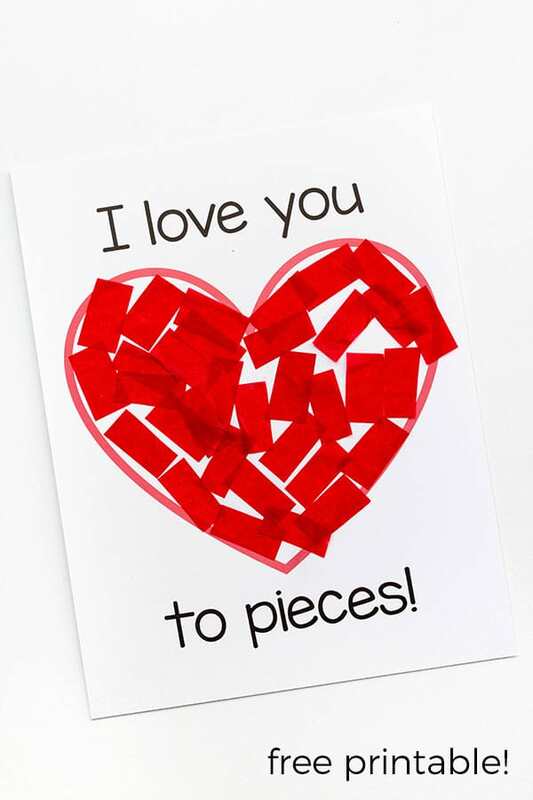 Cut the clear contact paper so that you have a rectangle that is slightly bigger than the heart opening on the printable. Peel the backing off of the contact paper and stick it to the back of the printable so that the sticky side is facing out to the front. Repeat steps 2-4 for each printable you are using. *If you want to make it even easier, you can just print the sheets out and have your kids glue pieces of tissue paper or construction paper to the heart and skip the contact paper. 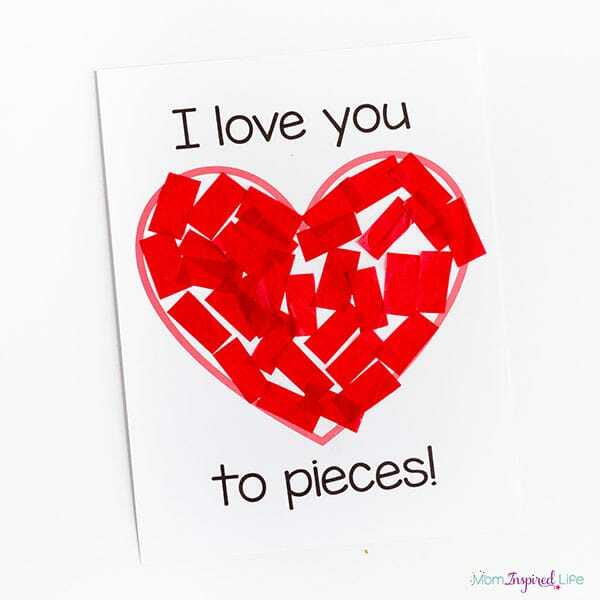 There are two ways you can do this I love you to pieces craft. Make that three. You can cut the tissue paper into squares or rectangles ahead of time and have them stick it to the paper. Or you can have them tear pieces of tissue paper off and stick it on. 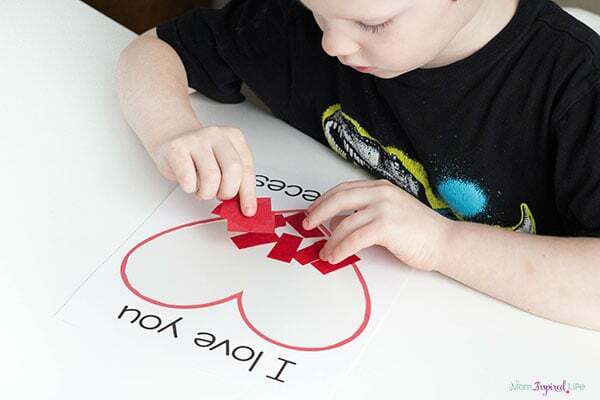 If you want to skip the contact paper all together you can just print the sheet off and have your kids glue the tissue paper or construction paper pieces to the heart. Give each child the tissue paper pieces or a large sheet to tear and instruct them to stick their pieces to the contact paper. 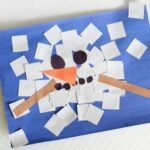 My toddler and preschooler loved this craft! That’s saying a lot because my son (5 years old) isn’t very interested in doing crafts. He really enjoyed tearing the paper! After they were done, I framed them in a dollar store frame to make them extra special. They look awesome hung up on a window too. 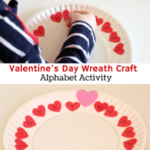 This Valentine’s Day craft activity is one we are sure to do again! I know the grandparents will love it! 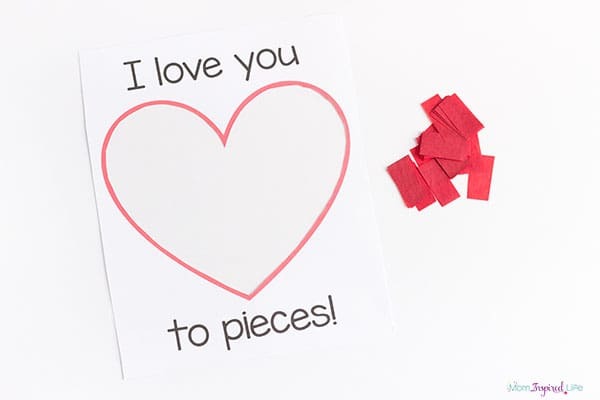 Click the button below to get your I love you to pieces printable! 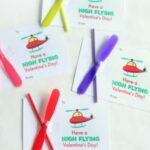 Here are some more Valentine’s Day Activities for Preschoolers! 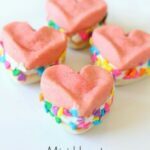 Valentine’s Day Activities that Preschoolers will Love!